The NVIDIA GeForce GT 520M is an entry level dedicated laptop graphics card presented in 2010. It is based on the GF119 or GF108 core, which are both related to the Fermi architecture. Depending on the version, it features a 64 Bit memory bus and higher clock rates (GF119 version) or a 128 Bit memory bus and slower clock rates. Theoretically, the card also supports fast GDDR5 memory, but due to cost limitations, DDR3 will be used by the laptop manufacturers. Compared to the GT 420M, the 520M offers only 48 instead of 96 shader cores. The GF119 offers 48 ALUs, 8 texture units and a 64 Bit memory interface for DDR3-VRAM. Therefore, it is similar to a half GF108 (GeForce GT 540M) but already manufactured with optimized transistors. As a difference the amount of raster-operation-processors (ROP) stayed the same counting 4. The GF119 is the smalles chip of the Fermi generation and is used for low end laptops. As an entry level card, the GT 520M has to compete against the Intel HD Graphics 3000 in the current Sandy Bridge processors. In our tests, the card was only slightly faster, but the better driver support did make a difference. However, demanding games like Battlefield 3 or The Witcher 2 are not playable. Other modern games only run in low details, and therefore gamers wont be pleased with the performance. Low demanding games like Fifa 12, however, are playable with high detail settings. As the other 500M series chips, the 520M supports Bitstream HD Audio (Blu-Ray) output via HDMI. That means the card is able to transfer Dolby True HD and DTS-HD bitstream-wise without quality loss to a HiFi receiver. The GT520M offers the PureVideo HD technology for video decoding. The included Video Processor 4 (VP4) in the GF108 chip supports feature set C and therefore the GPU is able to fully decode MPEG-1, MPEG-2, MPEG-4 Part 2 (MPEG-4 ASP - e.g., DivX or Xvid), VC-1/WMV9, and H.264 (VLD, IDCT, Motion Compensation, and Deblocking). The newer GF119 supports already the next generation VP5 (feature set D) with faster decodes, HD-to SD transcodes, lower power decodes and 4K x 4k resolution H.264 decode support. Through CUDA, OpenCL, and DirectCompute 2.1 support, the GeForce GT 520M can be of help in general calculations. For example, the stream processor can considerably faster encode videos than a fast CPU can. Furthermore, physics calculations can be theoretically done by the GPU using PhysX (e.g. supported by Mafia 2 or Metro 2033) but the performance wont be sufficient for this. The power consumption of approximately 17 Watt (including board and memory) allows the usage of the 520M in small laptops. Furthermore, Optimus is supported (if implemented by the manufacturer) for automatic switching to the processor graphics card to save power. The NVIDIA GeForce GT 555M is a fast middle class graphics card for laptops. Depending on the version, it is based on the GF108, GF116 or GF106 architecture with different shader counts, clock speeds and memory configurations. It stems from the Fermi generation and supports DirectX 11 and OpenGL 4.0. The GF106 core of the GTX 555M is related to the GF100 core of the GeFore GTX 480M and offers 192 shaders and a 192 Bit memory bus for GDDR5. The GT 555M offers only 144 shaders and in some variants and a smaller memory bus with DDR3. Except for the memory controllers, the GF106 can basically be considered a halved GF104. Therefore, the architecture is not comparable to the old GT215 (e.g., GeForce GTS 350M) or GT216 (e.g., GeForce GT 330M) cores. Unlike the GF100, the smaller GF104, GF106, and GF108 cores have been both shortened and considerably modified. In contrast to the GF100, which was designed for professional applications, these latter chips target the consumer market. They feature more shaders (3x16 instead of 2x16) and more texture units (8 instead of 4) and SFUs per streaming multi-processor (SM). Since there are still only 2 warp schedulers (versus 3 shader groups), Nvidia now uses superscalar execution to use the higher amount of shaders per SM more efficiently. In theory, the shaders can be utilized more efficiently and the performance per core can be improved. However, it's worth noting that the performance of the GF106 can also be worse than the GF100 (and its predecessors) in worst case scenarios. The ECC memory protection, which is important for professional applications, was completely omitted and the FP64 hardware was shortened (only 1/3 of the shader are FP64-capable and thereby only 1/12 of the FP32’s performance). Because of these cutbacks, the size of the SM grew only by 25% despite the higher number of shaders and larger warp schedulers with superscalar dispatch capabilities. Due to the different shader architectures and the higher clock rate of the shader domain, the core count of the Nvidia chip cannot be directly compared to AMD cores of the Radeon 5000 series (e.g. HD 5830). Detailed information on the GF104 architecture (and by extension also the GF106 and GF108) can be found in the desktop GTX 460 article by Anandtech. The GF114 and GF116 chips are slightly reworked chips that were introduced in 2011. Due to a changed transistor design, the clock rates were raised while maintaining more or less the same power consumption levels. The performance of the GT 555M is highly dependent on the version of the card (see above). The 3DMark 06 performance, for example, ranges from 8857 points (Lenovo Ideapad Y570) to 13000 points (MSI GX780R). For all intents and purposes, the GT 555M in the Lenovo is therefore essentially a fast GeForce 550M. The average GT 555M (with 144 shaders) is positioned in the lower high end class and enables users to play demanding games in high settings at 1366x768. Only Metro 2033 had to be played in lower settings during our benchmark tests (see below). A feature of the GF104/106/108 chips is the support for Bitstream HD Audio (Blu-Ray) output via HDMI. Similar to the Radeon HD 5730, the GT 555M can transfer Dolby True HD and DTS-HD bitstream-wise without quality loss to a HiFi receiver. The GT 555M offers PureVideo HD technology for video decoding. The included Video Processor 4 (VP4) supports feature set C and allows the GPU to fully decode MPEG-1, MPEG-2, MPEG-4 Part 2 (MPEG-4 ASP - e.g., DivX or Xvid), VC-1/WMV9, and H.264 (VLD, IDCT, Motion Compensation, and Deblocking). Through CUDA, OpenCL, and DirectCompute 2.1 support, the GeForce GT 555M can be of help in general calculations. For example, the stream processor can encode videos considerably faster than can a modern CPU. Furthermore, physics calculations can be done by the GPU using PhysX if supported, such as in Mafia 2 or Metro 2033. According to Nvidia, the GT 555M supports 3D Vision. It enables the laptop to send 3D content (3D games, 3D Web Streaming, 3D photos, 3D Blu-Rays) to a built-in 3D-enabled screen or an external 3D TV if supported by the laptop manufacturer and when not in conjunction with Optimus. The relatively high power consumption of the GeForce GT 555M suits it for larger laptops from 14-17". To save power, the card supports Optimus for automatic switching between the integrated graphics card from Intel and the Nvidia GPU. Even though the video card natively supports this feature, its implementation is fully dependent on the notebook manufacturer. The NVIDIA GeForce GT 540M is a fast middle class graphics card for laptops. It is based on the same chip as the GeForce GT 435M but with slightly higher clock speeds. Furthermore, it supports GDDR5 and 900MHz DDR3 graphics memory. Unfortunately, no models have utilized GDDR5 due to the increase in power consumption and higher prices compared to DDR3 VRAM. The GT 540M is based on the same GF108 architecture as the older GT 435M. The GF108 stems from the GF100 (Fermi) DirectX 10 architecture. However, it is optimized for the consumer end (gaming) and stripped down to save power. More information on the architecture can be found on our GeForce GT 435M page. In general, the performance of the 540M lies between the Radeon HD 5650 and 5730 in our first benchmark tests. Therefore, the 540M is about 10% faster than the GT 435M using DDR3 graphics memory. Paired with a fast CPU, demanding games of 2010 should run fluently in medium to high details and SXGA (1280x1024) resolution. In our tests, for example, Call of Duty: Black Ops and StarCraft 2 ran fluently in high details and 1360x768. More gaming benchmarks can be found below. Demanding games released in 2011 like Anno 2070 or Skyrim will only run fluent in low to medium detail settings. A novelty of the GF104/106/108 chips is the support for Bitstream HD Audio (Blu-Ray) output via HDMI. Alike the Radeon HD 5730, the GT 540M can transfer Dolby True HD and DTS-HD bitstream without quality loss to a HiFi receiver. The GT 540M offers PureVideo HD technology for video decoding using the GPU. The integrated Video Processor 4 (VP4) supports feature set C and therefore the GPU is able to fully decode MPEG-1, MPEG-2, MPEG-4 Part 2 (MPEG-4 ASP - e.g., DivX or Xvid), VC-1/WMV9, and H.264 (VLD, IDCT, Motion Compensation, and Deblocking). Furthermore, the GPU is able to decode two 1080p streams simultaneously (e.g. for Blu-Ray Picture-in-Picture). 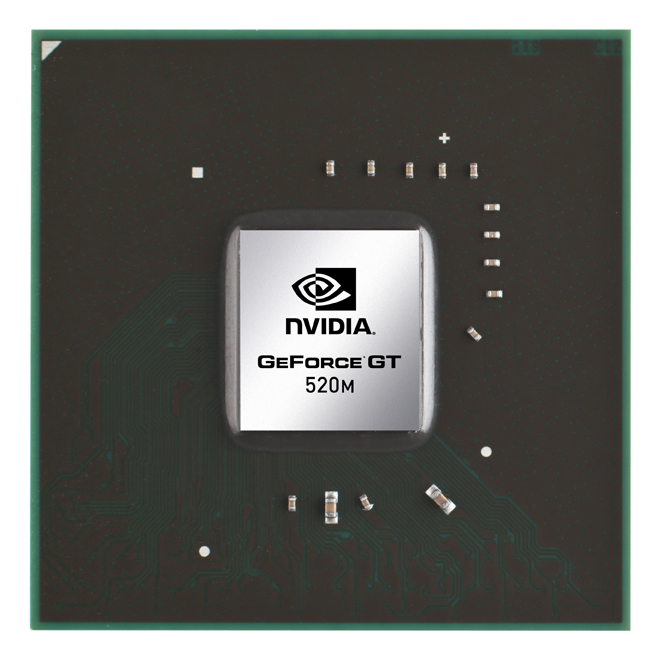 Through CUDA, OpenCL and DirectCompute 2.1 support, the GeForce GT 540M can be of help in general calculations. For example, the stream processor can encode videos considerably faster than can a modern CPU. Furthermore, physics calculations can be done by the GPU using PhysX (supported by Mafia 2 and Metro 2033). However, the GPU is not fast enough to calculate PhysX high detail game settings. Following the current 3D trend, the 540M supports 3D Vision. It enables the laptop to send 3D content (3D games, 3D Web Streaming, 3D photos, 3D Blu-Rays) to a built-in 3D-enabled screen or an external 3D TV if supported by the manufacturer. This feature is disabled if the notebook includes Optimus. The power consumption of the GeForce GT 540M should be similar to the GeForce GT 435M or Radeon HD 5730 and is therefore suited for 15" or larger laptops. Without load, the chip is clocked approximately at 50/101/137 MHz (chip/shader/memory) in 2D mode and 202/405/324 in 3D mode to save power. Furthermore, the 500M series supports Optimus to automatically switch between the integrated graphics card from Intel and the Nvidia GPU. The implementation of the Nvidia graphics switching technology is dependent on the laptop manufacturer.